Sukedachi 09 has been published digitally in English by Crunchyroll since August 17, 2016. It has also been published in Brazilian Portuguese by Panini Comics. Ultimate penalty delivered to murderers in order to provide peace of mind for victims families. Sukedachi force composed of unique people with harsh pasts. Wounded and wronged, with different reasons. Some want to deliver justice, some seek own revenge. Victims families, allowed to silently watch death matches between officers and murderers. Each side can kill another. Thin and blurred line lying between judgement and crime. What is right and ethic? Is this new law prohibiting others from felony or giving birth to more twisted minds and terrorism? // Ethic problems mixed with effective fights and characters life problems. Great, interesting story, definitely worth to read. Biggest disadvantage? Too short - definitely could be longer. There wasn't enough space for character development. I have feeling that story has been left in half way, unfinished. Door exist for sequel, however there are no signs that will ever happen. Seeing as how there's been no reviews, I'll make one. Sukedachi Nine...I'm sure we've all heard of Seishi Kishimoto by now. If not from his series, 666 Satan, than from having read his twin brother's work, Naruto. Let's get down to it. If you're looking for a long series, then you're fresh out of luck. 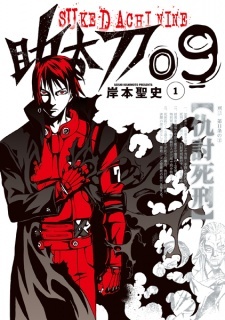 This series only has TWO translated/scanlated chapters, with a total of 6 chapters out right now. Search as you might, you'll find no cause or reasoning for this. Mangastream was the only group scanning this series, and they dropped it for unknown reasons. On that note, there is little character development, aside from the main character (he can't feel, and he hates being unclean; kinda like Levi). It's not the mangaka's fault, as we've only 2 chapters to rely on. If no English translations are made, then by the end of the year, I'll just drop the series, and go about my day. The story itself has a lot of promise and potential, the art is fantastic, and I enjoyed what little was presented to me. What pains me more is the fact that this series has two spinoffs and those won't be translated either. If I'm being generous, I'd say this series had the potential to follow in Attack on Titan's footsteps, in popularity and significance.